Hey friends, this is just a note about what Brian and I have been doing. In January, we spent a week in Boone, NC participating in the Adaptive Learn To Ski Clinic sponsored by the Patricia Neal Rehabilitation Center and other organizations that promote sports for the disabled. It was an AWESOME experience. This was Brian's second year to do this. Last year, after spending the first day on special SKIS, he insisted that he wanted to SNOWBOARD, so his instructor, Bobby Palm of New Mexico said to let him try it. Lo and behold, he did better on the snowboard! On the skis, you have four body parts that can go in different directions, but on the snowboard, everything is in ONE place! So, it was snowboard for the next three days. This year, we started off on the snowboard, and Brian was able to do "heel, toe, heel, toe," something he struggled with last year. You have to learn to do this if you want to control your turns. Adaptive skiing and snowboarding is fascinating! I am constantly amazed at the equipment that is invented to make these sports possible for people with disabilities. Brian's instructor was inducted into the Adaptive Skiers hall of Fame last year for all of his work with adapting ski and snowboard equipment for disabled snow sports enthusiasts. To participate, Brian has to wear a special seat belt when riding in the chairlift (just in case he were to have a seizure). Bobby attaches and releases this each time they get on and off the chairlift. To snowboard, Bobby attaches a ring to the front of Brian's snowboard, and then attaches tethers that go around Brian. Bobby skis behind Brian and kind of steers him (like you do with the reins of a horse). Brian is able to snowboard back and forth across the mountain with control. He still falls down and has to get back up, but he is learning and having FUN!! Unfortunately, because of his medical fragility, he does tire quickly and easily. The exertion and cold have also been issues we have had to deal with. Twice last year, Bobby, stopped the lesson at the top of the mountain, removed the snowboard, and skied down the mountain with Brian on his back, b/c he was on the point of having a seizure. This year, we had to shorten his lesson on two days for the same reason. However, it is a wonderful opportunity that Brian has thoroughly enjoyed, and I am so grateful for people who understand his limitations and are still willing to work with him to provide this incredible experience. 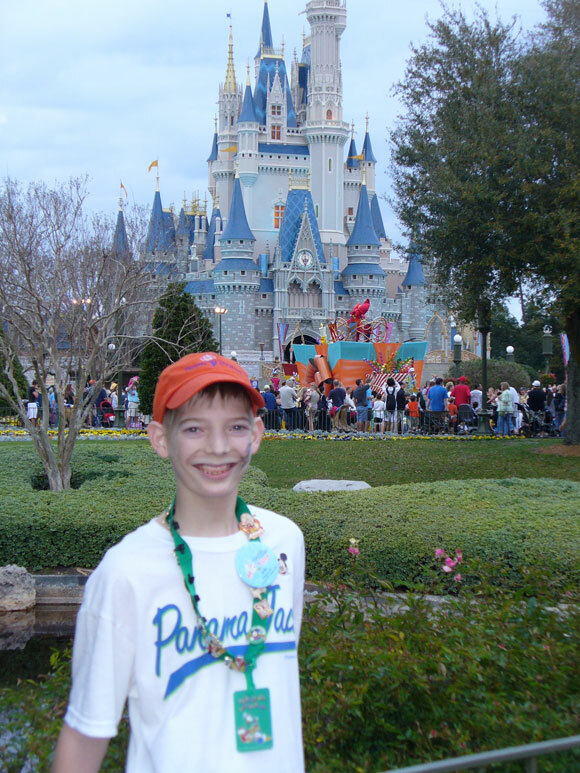 Four weeks later, at the end of February, the Dream Connection of Knoxville granted Brian his "Wish trip". 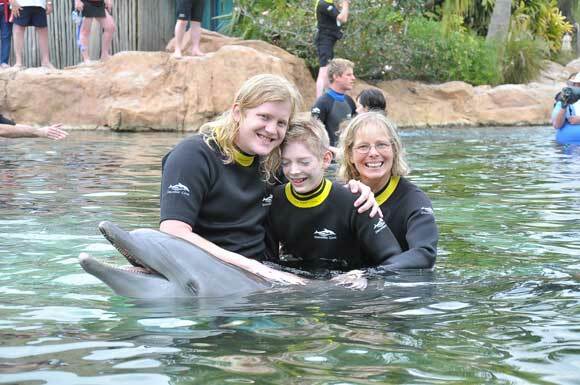 We spent a week in Orlando, FL, where he was able to "swim with the dolphins" at Discovery Cove on February 22. This was truly a unique and amazing experience. The morning was spent snorkeling in the coral reef lagoon amidst exotic fish, floating around the resort in the Lazy River, and feeding exotic birds in the two aviaries. 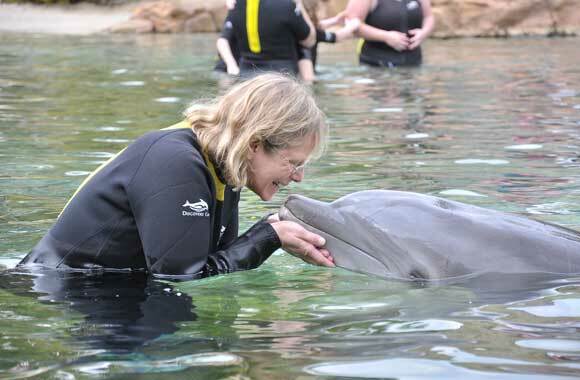 After a delicious lunch of grilled salmon, we spent half an hour with our dolphin, Akai, and his trainers Renee and Amy. 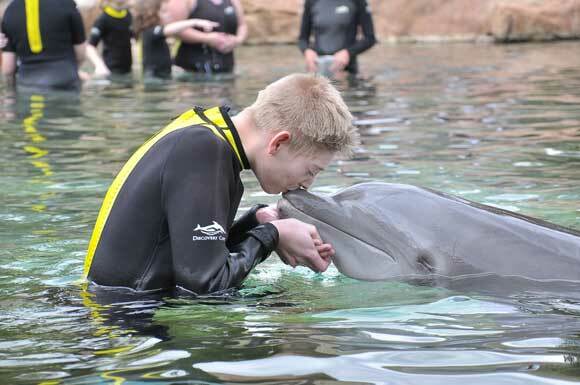 We were able to kiss, hug and swim with Akai. Grins, giggles, laughter, happiness, and pure euphoria enveloped us during this magical time with this incredible creature. 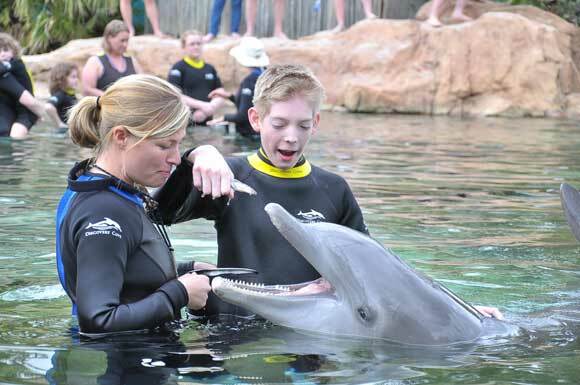 Later that week, we spent a day at Sea World (unfortunately, it was the day after the tragic death of the Orca trainer, Dawn Brancheau, something that saddened us very much). We continued to learn about the incredible marine animals in our world as we fed the stingrays, the dolphins, the sharks, and the sea lions. In addition to these two magical days with sea creatures, we were also able to go to the Magic Kingdom, Holly Wood Studios and Epcot at Disneyworld. 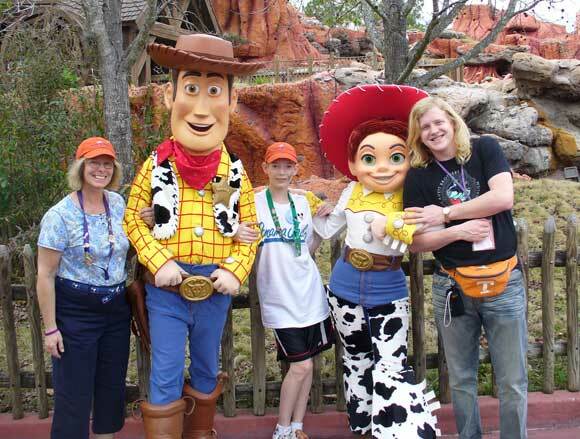 Brian LOVED meeting the characters and riding all the roller coasters with my 21-year old nephew, Brett, who accompanied us on this trip. He was awesome with Brian and had a blast doing all this fun stuff with us. 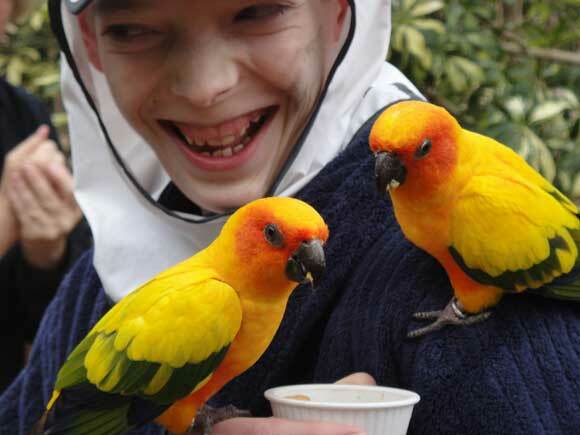 As part of our "wish trip", we stayed at a magical place just for the special needs kids and their families who come to Orlando for their wish trips. This resort in Kissimmee, FL, is called "Give Kids the World Village." Everything here is kid-sized, including the tables and chairs in the Gingerbread House where we ate all our meals. Brian made wishes at the wishing well in the Castle of Miracles and waited to hear what sound the coin would make when it hit the bottom of the well. He wrote his name on a gold star that the "Star Fairy" put up on the ceiling with the 10 thousands of other stars already there. He rode the Magical Carousel with glee. We spent one whole day "resting" in Amberville Station where he pushed the different buttons on the room-sized model trains, steered the remote controlled boats, and played the football video game. We stayed in a villa that looked like a blue castle with turrets and flags. Directly across from our villa was the world's largest Candy Land playground with the peppermint forest and everything! Each day the "Gift Fairy" would leave another special surprise in the villa for Brian. There was always something new, fun, and exciting to look forward to for all of us. We met families from all over the US, and even a family from England, people who all quickly became friends. Each day, Brian had his picture made with different characters including Mickey and Minnie Mouse, Goofy, Pluto, Belle (with whom he spent a long time and talked about many different subjects, with her telling him that she liked to read books about those subjects), Sponge Bob Square Pants, Scooby Doo and Shaggy. Thursday evening was Christmas, with a parade, artificial snow, Santa Claus, and dancing in the street. This incredible village is staffed with 1500 volunteers for each shift everyday. These volunteers are of all ages, people who want to be here, people who care and are giving back to others in our world. It is truly a magical village where happiness emanates from everyone and everything. This was a "week out of time" where Brian was "king". It was a week of being treated special, being loved and accepted for yourself no matter what your disability or illness. During this incredible week, I was forced to realize several things that I often forget. One is how medically fragile Brian still is, even though his seizures are mostly controlled these days. 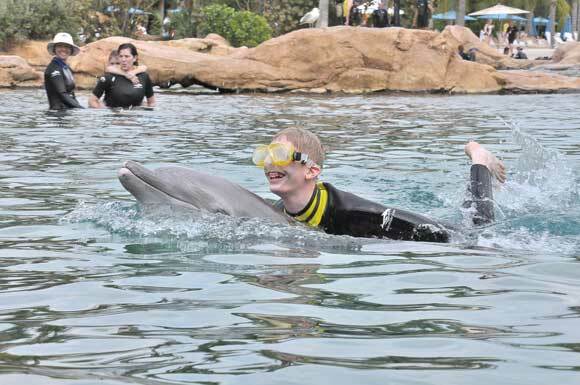 He almost had a seizure while at Discovery Cove b/c of the cold-water temperature in the coral reef lagoon. Even in a wet suit, after almost an hour in the 75-degree water, he started to become unresponsive. With the aid of the wonderful first aid staff and an hour rest to warm up and stop shivering, we were able to ward off a seizure and still swim with the dolphins that afternoon. In addition to this instance, we could see the physical signs of his frailty each day as he tired quickly and began to have a bluish tinge around his eyes by the mid afternoon and a slump in his posture. 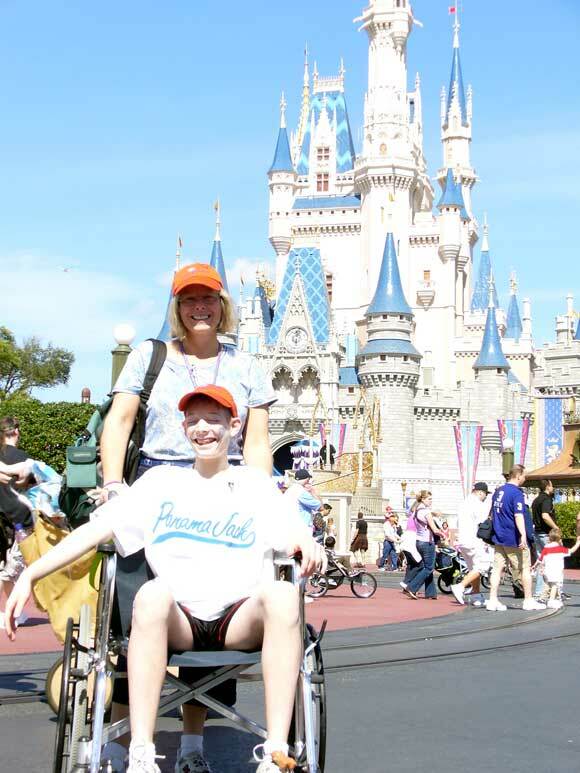 We were grateful to have a wheelchair to push him around the parks so that he could enjoy this special trip. Another thing that I realized is how grateful I am to have this incredible child and how thankful I am that God has spared his life so many times in the past 16 years as we have dealt with numerous seizures, multiple hospital and ICU stays, and more than a dozen episodes of status epilepticus. We are indeed fortunate to have been blessed with Brian, his exuberance, his energy, his loving, generous, giving, outgoing personality, his mischieveousness, and even his stubbornness. If not for his determination, he wouldn't have achieved so much of what he has learned and become. Two other things that I realized are that there are many other families in similar situations, living with a child who has a life-threatening illness, some of us with more hope than others. Finally, I was overwhelmed time and time again this past week with tear-filled eyes, for the generosity of so many people who made this trip a reality for Brian and for the other children and their families at the Give Kids the World Village. Everyone we met along this special journey went out of their way to do their best to ensure that this was a special and magical time for Brian. This started with the facilitators of Brian's wish, Wayne and Carolyn Art of the Dream Connection in Knoxville. On the day of our departure, this continued with Seam, the US Airways clerk who helped us get checked in at the Knoxville Airport. (He was there to greet us on our return as well). This continued with Bob, our greeter at the Orlando Airport, Victor, our greeter at the GKTW Village, the volunteers at the GKTW village who staffed the kitchen and serving areas in the Gingerbread house and the Ice Cream Parlor, the volunteers who played with the kids at the Candy Land party, Kid's Night Out party, in Amberville Station and the Castle of Miracles. Everywhere we turned, the volunteers were smiling, accommodating, loving, and helpful. This was also true at the Magic Kingdom, Discovery Cove, Sea World, just everywhere we went. God has blessed us in many ways by the people who have touched our lives, and for this I am grateful. Submitted 3 March 2010 (by Brenda Ferrell). Thank you Shazza for finding ways to be a support and encourager for these new families. I'm so glad that God has given you this gift. We are so fortunate in our Dravet family to have so many people with such varied talents, interests, and gifts who are willing to share their particular area of expertise with the rest of the Dravet community and to make a positive difference and to provide hope, support and encouragement to those who are new to the Dravet journey. Go girl!!!" 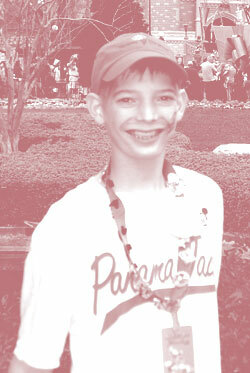 I too want people to know that a Dravet Syndrome Diagnosis is not all doom and gloom. A little good and a little happiness can sometimes emerge from the most unlikely of situations.